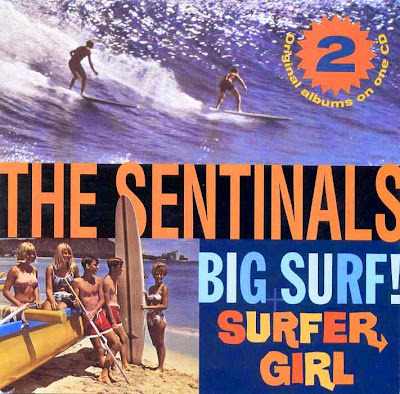 The Sentinals were among the host of start-up combos to have emerged from the fertile environs of California's Central Coast scene circa the early '60s. After scoring some regional fame and issuing a handful of 45s -- most notably the haunting "Latinia" -- on local independent labels, they were signed to the premiere surf imprint, Del-Fi, in the summer of 1963. While co-founder Tommy Nunes (guitar) provided the lion's share of the tunes for the Big Surf! album, The Sentinals likewise reworked a few selections that had already made an impact on the burgeoning coastline craze. Their open-throttled reading of the Isley Brothers' "Shout," the equally rousing rendition of the Beach Boys' "Surfin'," and the compact arrangement of R&B guitarist Freddie King's signature song, "Hideaway," are but a few. But one of the more peculiar covers is derived from the pen of Argentinean-born composer Lalo Schifrin, who would become best known for the theme to Mission Impossible. Years earlier, Schifrin had gained notice with several Latin-flavored jazz instrumentals, "Latin Soul" being one of his first. Interestingly, the band shared no less than five sides with Bob Vaught & the Renegaids, whose 1963 Surf Crazy LP included "Exotic," "Intoxico," "Surfin' Tragedy," Nunes' own "Latinia," and "Tor-Chula," based on the Champs' "Tequila." The title track, the gritty "Revellion," and the somewhat typical midtempo stomp "Sunset Beach" are a few of the other key entries.